You might think that watching the Metropolitan Opera’s season of live in HD simulcasts, plus their second showings of same, plus their summer encores (going on now) of the most well-known operas would be enough opera for me. But you would be wrong. For a true opera fan, some opera is too little. We must have more. So today, I drove a zillion miles from my backwoods home to civilization, to a nearly deserted movie theater that shows the Opera in Cinema series. Opera in Cinema is the name that Emerging Pictures uses for its little-heralded repertory that has sneaked onto the HD simulcast movie-theater scene. Most opera fans don’t know about it. I haven’t seen one in this series yet that had more than thirty people in the audience. Which is a shame, because Opera in Cinema brings opera from several major European opera houses that it would cost a fortune and be a major effort to visit on one’s own. There are significant differences from what the Met does. There’s no opera star as a host. Between acts, there are no inane backstage interviews such as the Met does. (What a relief. Where do they get those completely stupid questions? Do they just copy them wholesale from the worst TV journalists? “How does it feel…?” Oh, please. Ask something intelligent.) With Opera in Cinema, it’s just the opera, straight out. I like that. 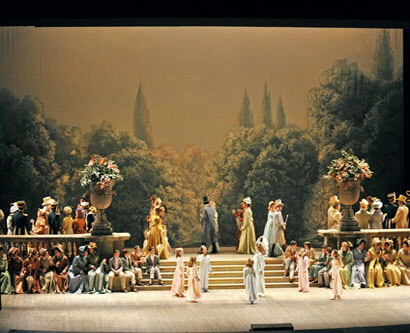 Most of all, I like the idea of seeing opera from different companies in different countries, each with its own production tics and techniques. The singers of course tend to be familiar, since casting is international. But not always. Which brings me back to today, and the matinée live performance from the Gran Teatre del Liceu in Barcelona, Spain, of Queen of Spades. To be honest, I’ve never been a fan of this Tchaikovsky opera. I have dutifully watched it a couple of times with Placido Domingo in the lead as the gambling-obsessed Hermann. Domingo plays him as a loser, just as he always played Don Jose in Carmen as one. Today’s performer, Misha Didyk, did not. In fact, Didyk is startlingly handsome upon first view (sorry, I couldn’t find a good shot of him, but you can visit the Liceu site and sort of see what I saw) which makes the whole story very different. This guy could have the world, I think. He then proceeds to show us a version of Hermann as a crazy man who finally loses it entirely. Quite fun. Not so much fun were the first few minutes of the opera, which the originating theater managed to screw up in a new and different manner from anything I’ve encountered before. I’m used to the HD signal breaking up briefly. Sunspot activity can cause that, among other things. Today, the Liceu actually sent two channels of music at once. During the overture, we also were hearing another opera. During the first act, we also were hearing another opera. Then we were only hearing that other opera (which I did not recognize). Then we were hearing nothing. Then back to Bizarre Stereo. The harried theater manager explained the obvious, that this was not under his control, and offered refunds. Many people rose up and left. My stubborn need to justify my 152-mile round trip kept me in my seat. A few minutes of completely crazy music later, the correct sound finally was isolated, and from then on it was smooth sailing. The good thing was that all we’d really missed was the usual first-act “we are the happy villagers” song, which I have always believed composers put in because they knew the aristocratic patrons arrived late at the theater. Oh, sure, the peasants are there to set the scene, but it’s dull stuff. 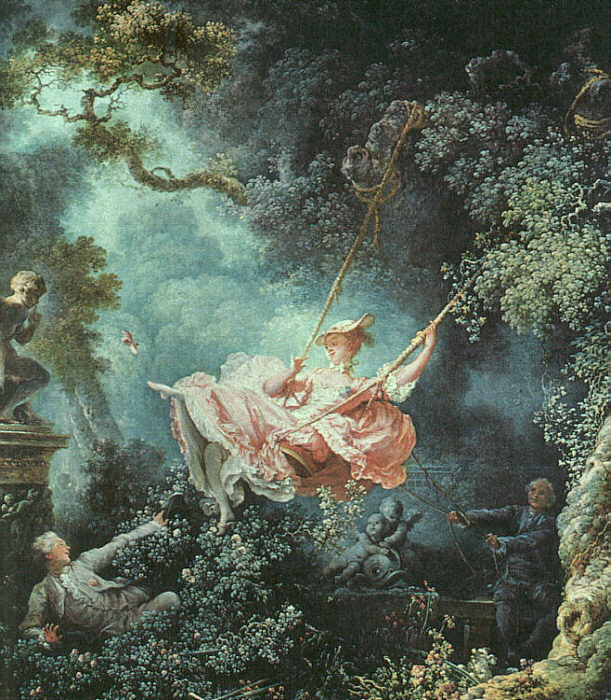 Today’s was just as bad as usual, but the scenery, with its deliberate evocation of a Fragonard, was perfect for what would come later. After all, the countess is the center of this opera, and her glory days in Paris during the time of Madame de Pompadour are the key to Hermann’s obsession. This visual foretaste of the truly touching scene in which the elderly lady recalls–in French, not Russian–her youthful encounters at court was just right. Obviously, I enjoyed my afternoon at the opera, but it’s too late at night for a long review, and anyway, I don’t have the musical background to do the details justice. For such expertise, I usually turn to opera blogs, among them Parterre Box, which is patronized by a cadre of exceedingly knowledgeable opera fans, many of whom appear to have worked in the industry (or still do)–and most of whom can’t resist a witty pun or a naughty bon mot. Imagine my surprise today when I started talking with a couple other diehards at Queen of Spades, and found that they knew my nom de Parterre, and had noms de Parterre of their own. What are they? I’ll never tell. Maybe next time I attend an opera at a movie house, I’ll meet up with those Parterreians again. Or others. As much pleasure as sitting by myself in a theater just enjoying an opera gives me, I also like to talk to other opera fans, both in person and on the net. Which is why I participate in the sly fun on many an opera blog, with different names for different blogs. It’s like playing a role in an opera–without any singing talent, alas.